Death of the Google Case – A Big Win for the Commissioner? With the anticipated settlement in the Google search case (amongst other things), journalists keep asking whether this represents a major win for the Commissioner. Like I have said before, the best way to address this question consists in assessing the substantive merits of the case. The settlement certainly represents a major win if one believes that the case is meritless (I have argued this elsewhere). The FTC’s decision to do nothing on search supports this theory. In contrast, this settlement is not a major win if one believes that the case is strong, and that the Commission could have easily pushed for an Article 7 decision (I have also made arguments to this effect, given the loose substantive and judicial review standards promoted by the EU courts in abuse cases). But there’s one thing which may have dissuaded the Commissioner and his administration from using the conventional Article 7 track (remember, he actually voiced his disinterest for the Article 7 procedure and pleaded that fast moving markets need fast enforcement mechanisms (read Article 9): the protracted duration of such proceedings. The Commissioner’s mandate expires somewhere in the Fall of 2014. Under an Article 7 procedure, he might no longer have been in office to sign the prohibition decision. In short, to put the Google case on his hunt list, Almunia needed a settlement. But is it really true that it takes so much time to adopt an Article 7 prohibition decision in an abuse case? After all, we are now 3 years and 2 months after the initial complaints in the Google case (they date back to February 2010), and the supposed celerity of Article 9 decisions seems all the more relative. Two things stand out of this review: 1. Article 7 decisions can be adopted in 3-4 years; 2. cases with formal complainants are much longer than cases without. Against this backdrop, the Commission could thus not have conceivably adopted an Article 7 decision before the term of Almunia’s mandate. So if the Commission is ever to settle with Google, this will clearly be a big win for Commissioner Almunia. 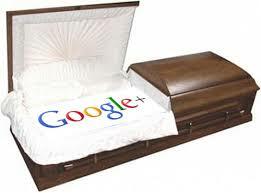 PS: for a funny paper on Google death inactive account manager service, see here. PS2: for yet another ordinary interview of the author of this post in the press, see here.